Instead of seeing Pakistan, May be you should look at India. Not too long ago, you were in the same position. These are things that can happen with bad economic policies & can be dealt with. Azad: "May be you should look at India. Not too long ago, you were in the same position. These are things that can happen with bad economic policies & can be dealt with." India runs huge #trade deficits year after year. It's heavily dependent on western money for its #economy to survive. If it wasn't for the end of the Cold War, India would be in serious trouble. Pakistani businessman are already being alienated by European customers due to FATF action. We must focus on China and make best use. Facing regular scrutiny in Europe while Chinese are more open minded. Also culturally we are more close to Chinese compared to western countries. Better we call it "Forex Reserves" than western money. India isn't only country who had boosted growth in per capita GDP after economic liberalization. China did it. ROK even transformed into developed country. And they also invest in other countries. West doesn't literally "love" any country. Nor India's relations have been very good with West, no matter what how much people hype. AG: " India isn't only country who had boosted growth in per capita GDP after economic liberalization. China did it." We're not talking about domestic growth here; instead, the topic is trade gap and current account gap. Like Pakistan, India too runs huge trade deficits and it needs foreign inflows to pay for the difference. These inflows come from the West which sees India as a strategic ally since the end of the Cold War. India's trade deficit has widened to USD 165.52 billion during the 11 months of the current fiscal from USD 148.55 billion compared to the year-ago period, the data said. I repeat, those inflows aren't there because west has some sort of love for India. Pakistan has been an ally of West way before end of Cold War. China has even better inflows. One will invest capital for sure if returns are guaranteed. And that needs stability. Pakistan has had an overvalued exchange rate, low interest rates, and subdued inflation over the last few years. This loose monetary policy has led to high domestic demand, with two-thirds of Pakistan’s economic growth stemming from domestic consumption. An overvalued exchange rate has led to a very high level of imports and impeded exports. Pakistan’s high fiscal deficit was accelerated even further in 2017 and 2018 because elections have historically caused spending to rise (both of the most recent fiscal crises followed elections). Perhaps the greatest financial issues facing Pakistan are its pervasive tax evasion, miserably low savings and chronically low level of domestic resource mobilization. Taxes in Pakistan comprise less than 10 percent of GDP, a far cry from the 15-20 percent of countries that are in it's neighborhood. Pakistan also suffers from impediments and gross mismanagement in the energy sector causing frequent and widespread power outages that hurt its competitiveness on top of the over-valued rupee. While other developing countries and countries in its neighborhood have made structural progress and improved their external trade, Pakistan has had a reversal. 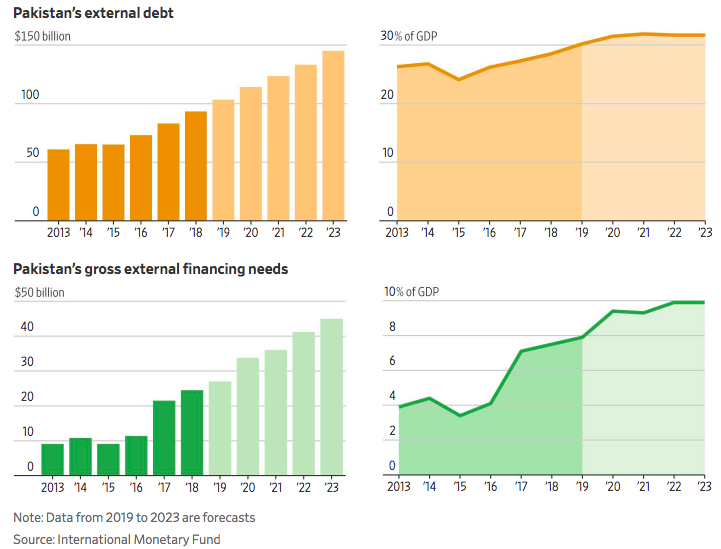 Moreover, its rivalries and parity seeking focus forces the country to over rely on China in its infrastructure projects and an opaque debt burden. Near term outlook suggests hampered GDP growth of around 4%. AG: "I repeat, those inflows aren't there because west has some sort of love for India......China has even better inflows." It's not love for India but strategic interests that guide West's policies. And right now, the West sees checking China's rise as its topmost priority in which India is seen as plying a role. Bulk of China's inflows are made of export surpluses with many countries....including India. China's trade surplus with India exceeds $50 billion a year. According to my sources a pleasant surprise is awaiting IMF from China. China will propose dollar-for-dollar matching against objections raised from IMF. There is no praise left for mastery of Chinese strategy. 1. For India Oil is #1 import of Oil, almost 34%. Oil price is not it use to be and with the coming collapse of Oil price, things will go better only. Also India will use more of Iranian imports paying in Rupees. 2. Per RBI data, India's forex reserves grows at $2USBD every week. In other words it takes india just two months to grow more reserves than Pak's entire reserves. 3. Pak has to worry as to why no one wants to invest in Pak. CPEC seems to be doing diddly squat to improve Pak's economy. 4. When OIl price collapses, gulf jobs will vanish. Pak will be double hit with loss of remittance, a key factor in pak's forex. The long term strategy should be to take annual cotton production to 20 million bales in 5 years or so. The need is to work on our agriculture strength. The cotton seed market is orphan today with too many kids on the street – every district has multiple unregulated seed companies. The stewardship is missing. Industry players are of the opinion that the seed industry needs to be regulated and serious consolidation is required to improve the yield. The other factor is to do away with price support to other crops – such as sugarcane, which has resulted in substitution to sugarcane from cotton. Riazbhai please mayus na ho. Pakistan has big oil reserves and gold and inshallah we will be in a diiferent league. Time aayega jab har banda will be strong with money in pockets inshallah and the world will look at Pakistan with praise. Pakistan Zindabad! Sad that our politicians are not upping the game to match the Chinese. My sources say when China was approached to share CPEC details with IMF, the Chinese had offered choice of blue pill and red pill. Asad chose the red pill, while IK will now appoint someone who will choose the blue pill. Hope Rawalpindi gets some help going. Yeh Umar ka resignation is a backward step. Lot of youth like myself had lot of trust and faith in Umar saheb now we are in danger zone as far as our economy and image. He was trying to make Pakistan strong inshallah so that we can stand on our feet and not be begging on other countries. Riazsir, IMF downgraded GDP growth next fiscal to 2.9! What can be done to improve it? Your comments appreciated. Thank You. Pakistan macro-economic poor performance will lead to Bangladesh eclipsing Pakistan in PPP Per Capita much earlier now. Economists at IMF (Pak loan pending) estimate Pakistan PPP Per Capita in 2024 at $6735 and Bangladesh at $7372. India will be at $12757. Also note that Bangladesh Per Capita Nominal edged ahead of Pakistan in 2018. Pakistan’s ll major industrial sectors attracted considerably high foreign direct investments (FDI) during the current financial year indicating an attraction for industrial growth in near future. The country’s key industries such as textile, chemicals, pharmaceuticals, and electrical machinery saw their inflows jumping by 50-800 per cent. However, the overall FDI plunged by 51pc during the first nine months of 2018-19 mainly due to outflow of Chinese investments from the local power sector, which in turn eroded the positive impact on inflows in the major industries. Outflow of Chinese investment during the period was $294 million, as compared to net inflow of $929m in same months of last fiscal year. The highest inflows were recorded in electrical machinery, which attracted $126.6m during 9MFY19 as against $13.8m in corresponding period last year, reflecting an increase of 813pc. Transport sector came in second as inflows into the sector jumped by 663pc to $84.3m, led by FDI worth $89.6m in cars whereas buses, trucks, vans and trails posted a $5.3m outflow. Similarly, inflows in chemicals soared by 322pc to $113.9m during 9MFY19 versus $27.6m in same period of 207-18 while those in pharmaceutical rose 274pc to $55m from $14.7m. The FDI in textile sector clocked in at $54m during the nine-month period, up 50pc over $36.6m in corresponding months of FY18. The sector earns over 60pc of all export proceeds for the country. For the last couple of years, only two sectors – power and construction – have found themselves on the radar of investors while the rest have seen limited activity in terms of inflows. If latest data is to serve as an indicator for reversal, it could help boost sentiments in the local industry. Power sector saw a steep decline in FDI as it recorded a net outflow of $293m in 9MFY19 as against $929m in corresponding period last year. Construction also seems to be ceding its gains with inflows shrinking steeply as investment in the sector slowed down to $385.4m, from $527m. Communications saw a net outflow of $141m, led by telecommunications which recorded outflows worth $157m.